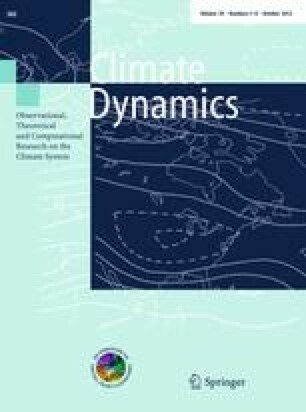 Within the CIRCE project “Climate change and Impact Research: the Mediterranean Environment”, an ensemble of high resolution coupled atmosphere–ocean regional climate models (AORCMs) are used to simulate the Mediterranean climate for the period 1950–2050. For the first time, realistic net surface air-sea fluxes are obtained. The sea surface temperature (SST) variability is consistent with the atmospheric forcing above it and oceanic constraints. The surface fluxes respond to external forcing under a warming climate and show an equivalent trend in all models. This study focuses on the present day and on the evolution of the heat and water budget over the Mediterranean Sea under the SRES-A1B scenario. On the contrary to previous studies, the net total heat budget is negative over the present period in all AORCMs and satisfies the heat closure budget controlled by a net positive heat gain at the strait of Gibraltar in the present climate. Under climate change scenario, some models predict a warming of the Mediterranean Sea from the ocean surface (positive net heat flux) in addition to the positive flux at the strait of Gibraltar for the 2021–2050 period. The shortwave and latent flux are increasing and the longwave and sensible fluxes are decreasing compared to the 1961–1990 period due to a reduction of the cloud cover and an increase in greenhouse gases (GHGs) and SSTs over the 2021–2050 period. The AORCMs provide a good estimates of the water budget with a drying of the region during the twenty-first century. For the ensemble mean, he decrease in precipitation and runoff is about 10 and 15% respectively and the increase in evaporation is much weaker, about 2% compared to the 1961–1990 period which confirm results obtained in recent studies. Despite a clear consistency in the trends and results between the models, this study also underlines important differences in the model set-ups, methodology and choices of some physical parameters inducing some difference in the various air-sea fluxes. An evaluation of the uncertainty sources and possible improvement for future generation of AORCMs highlights the importance of the parameterisation of the ocean albedo, rivers and cloud cover. An erratum to this article can be found at http://dx.doi.org/10.1007/s00382-012-1307-2. The authors would like to thank to CIRCE partners from making the data and some diagnostics available for this study. The financial support of this work has been provided by the European Project CIRCE: Integrated Project Climate Change and Impact Research: the Mediterranean Environment, under contract No. 036961. This work is also part of the HyMeX program. We would like to thank W. Ludwig and E. Stanev for providing us with river runoff and Black Sea dataset respectively. We also thank J.-L. Dufresne and G. Jordà for useful discussions about the Gibraltar and surface heat balance. We are grateful to Marc Lucas for a careful reading of the manuscript. The authors thank also the two anonymous reviewers for useful comments.